The twin sisters, Ria and Henriëtte have spent their lifetime around all kind of animals, especially horses. From childhood on there was a special connection with nature and the animal kingdom in particular. 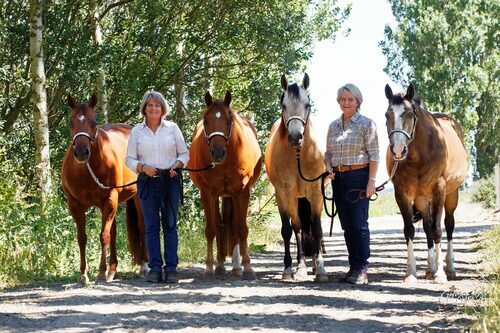 They have more than 35 years’ experience in riding and training horses in Dressage, Reining and Halter. Their 4-legged horse companions Beau, Sparky, Smart and Nic are a big part of their lives. Ria and Henriëtte believe that animals don’t come by accident in your life, but they are with you for a purpose and have a special message or lesson for you. Their first quarter horse Beau let them to the path of Healing Touch for Animals® and Aromatherapy. Sparky (their second horse) challenged them to have faith in energy work and essential oils, as she became seriously ill a couple of times. They are both Certified Healing Touch for Animals® practitioners and instructors for Europe. In their holistic private practice “Pets & People” they are focused on helping animals and their people to regain their optimum health and well-being, using Healing Touch techniques, tuning forks and essential oils. Their interest and education in aromatherapy for animals started in 2006 when they learned that the energy healing techniques work beautifully together with the energy of plants (essential oils). Since then Ria and Henriëtte are passionate about raising awareness and educating people how toxic everyday used products are. A conscious choice to only use plant based products (like essential oils) will not only enhance the health and wellbeing of you and your pets, but will also preserve nature. At this moment they are recognized as experienced aromatherapists, especially for animals. Henriëtte was a guest speaker on this topic during the 2017 Young Living convention in Europe. Both are also healthy lifestyle coaches and the authors of the upcoming book about improving health and wellbeing with essential oils and plant based products. - why essential oils support health and wellbeing? - how you can apply them? Ria and Henriëtte have witnessed the effectiveness of the oils on a physical, mental, emotional and spiritual level. They love to empower people to take charge of their own and their animal’s health and wellbeing by the support of these gifts of nature. Many lives –of animals and people alike- were already transformed, how about yours? Do you want to learn more about the amazing possibilities of essential oils and how they can improve your pets life? The twins offer several workshops (also in English), contact them for further information.